So we all know that Ikea is great for adding inexpensive designs elements to any room! But how about their sewing line? 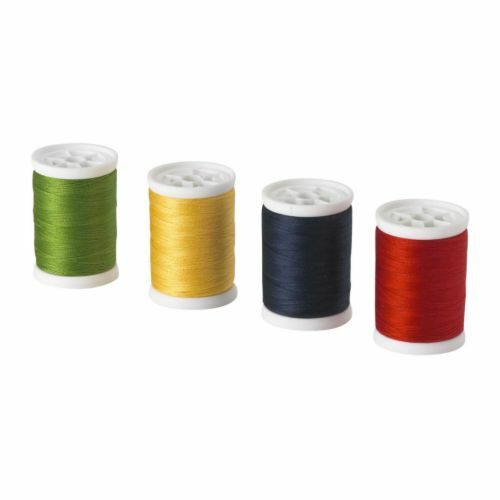 This 4 pack of thread on Ikea's website is only $1.99, but is it worth even that little bit of money? I tried coming up with valuable information about whether or not their fabric and sewing notions were of good quality, but couldn't really find anything within the blogging community, so what's a sewing craft blogger to do? Well, you guessed it... I emailed them wanting to know the answer to my questions! I got an automated response back saying they would reply in 24 - 48 hours. I guess we will ALL find out if they are willing to let me experiment with their stuff and give you decent feedback! I kind of felt a little like a weirdo asking them if their $2 thread was worth the $2, but so many of us are on a budget and I know you would like to know whether or not it is quality! I had to buy thread today from a local chain store and it cost about $11 for 3 spools of thread....not really a deal, but I needed it, so I bought it. Ikea also has some fun fabrics for online viewing only! You can't purchase any of these sewing notions online right now. Too bad...because I know so many of you are online fabric buyers! I most certainly would love to order a few yards of this cutesy fabric to try out! I wish my closest store wasn't an hour and half away!!! Anyways, while I am waiting on Ikea to get back to me, I thought I would ask if any of you have ever bought or used anything from Ikea's sewing and fabric line and if you would recommend it to my readers! I know we all would love to know for our future fabric endeavors!